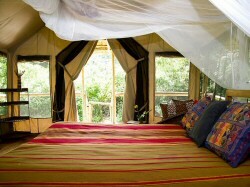 Kibale Forest Camp is suited off Fort port-Kamwenge, subsequent to the park’s edge. On your way to For Port, you will a signpost with a kilometer of about 3.5 to our camp. After passing Bigodi village, you will meet another signpost that will take you to the dirt road heading to our camp. This is just 1 kilometer to be there within no time. The camp is well designed with about 7 safari tents; containing double beds with en-suite bathroom along with an eco friendly toilet. The verandah will give you a perfect view of the colobus monkeys in the forest. These include Chimp tracking, Forest walk, hiking at the slopes of Mount Rwenzoria, Cultural heritage and Bigodi village walk discovering the crater lakes. Hello! My husband and I would like to book with you at Kibale Forest Camp Uganda – Friday and Saturday night, August 31 – September 1 2018. We also are hoping to book the full day Chimpanzee Habituation Experience on Saturday September 1. Please let me know pricing and availability as soon as you are able.